NOTE: Before I begin, I’d like to mention that the paperback version of this book I received is not called From Good to Great Writing: 52 Strategies for Writing with Style as it is listed on Goodreads. It is called what it is on the cover picture—Mastering the Craft of Writing: How to Write with Clarity, Emphasis, and Style. It is also not 224 pages, but approximately 312, the same amount as the eBook version. With that said Therefore, I’ll be referring to this text as “Mastering the Craft of Writing” throughout the review. Clarity is one of my biggest problems in writing. I’m often write, unintentionally, “purple prose,” vague sentences that might be beautiful and pleasing to the ear, but just don’t get my point across. As someone who wants to write fiction for a living, that can’t happen. At all. I don’t want my readers to be confused for any reason. The moment my reader becomes confused, the moment they put down my book and cost me a sale. Because of this desire to improve my clarity, I went out and bought this book, and I’m very glad I did. 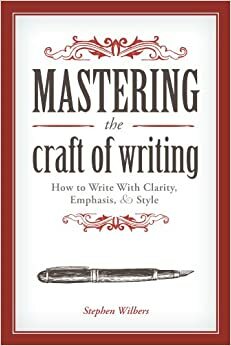 Mastering the Craft of Writing by Stephen Wilbers is a very accessible guide to writing clearly, emphatically, and stylistically. Each of its short, fifty-two chapters discusses how to improve your writing on word-by-word, sentence-by-sentence, and paragraph-by-paragraph levels. Furthermore, Wilbers demonstrates his notable skills as a writer and teacher. For example, in the “NOTE” section, notice that I crossed out the phrase, “With that said,” and replaced it with “Therefore”. The phrase “that said,” is an example of a vogue expression, a filler phrase that doesn’t really say much at all. In chapter 47 of Mastering the Craft, Wilbers encourages writers to use more precise language in place of vogue expressions, such as “therefore,” “furthermore,” etc. However, I think using “that said” is okay sometimes—especially in fiction, where authors run into the possibility of having characters that don’t speak with formal diction, or a narrator with tons of verbal tics and filler phrases. And what makes Mastering the Craft so good is that Wilbers acknowledges exceptions like this. In the last chapter, he discusses what it means for a writer to develop a persona, and how your word choices affect the impression you want to leave on your reader. Because I used “Therefore,” I created a persona that is more formal to you, the reader, and it is this kind of thought process about your writing that will make it stronger. The mark of a great writer is seen in those who lace purpose and intent behind every word they put down on paper, because they know, as Wilbers puts it, that “[w]riting is power” (290). For advanced writers, or those who have read past classic texts on writing such as Strunk’s The Elements of Style and Zinsser’s On Writing Well, I expect that not much will be new to you. Wilbers refers to these and other texts on writing quite a bit. But for beginning, intermediate, or nearly advanced writers out there who want to to make sure their sentences do justice to their compositions as a whole—be it for business writing, technical writing, novel writing, or anything else, I recommend picking this one up (along with all the other great writing books Wilbers refers to). Like Wilbers recommends, read it once through without doing any of the exercises, to get excited about words and their power, and then read it a second time, devoting one week to each technique discussed. I’ve gone through the first read already, and when I read it for a second time, I can’t wait to kiss my clarity issues goodbye. Thank you for adding my review to your “Related Articles” 😀 ! I definitely think Mastering the Craft is good for business writing, too, and so does the author.